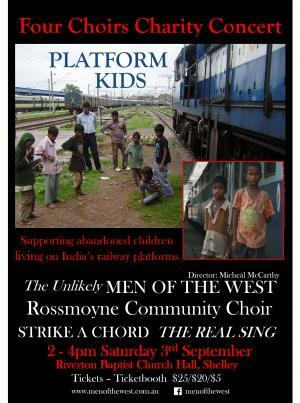 Four choirs will come together on September 3rd to help raise funds for The Platform Kids Fund Inc, a charity that provides care for children abandoned and begging on Indian railway platforms. The concert is being hosted by the Unlikely Men of the West. You may recognise this choir, directed by Micheál McCarthy, as the artists formerly known as the Spooky Men of the West - a black, be-hatted behemoth of blokes who sing. Strike a Chord, a “sassy group of ladies who love to sing and have fun doing it,” together with the Rossmoyne Community Singers. A fine afternoon’s entertainment is guaranteed with songs ranging from classic Pop hits, Contemporary Jazz, Music Theatre, plus traditional, ancient Georgian harmonies.